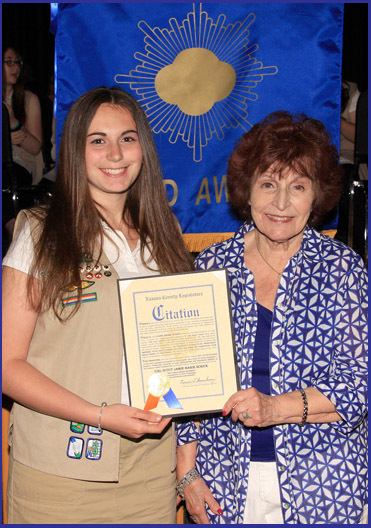 Presiding Officer Norma L. Gonsalves recently attended the 2014 Gold and Silver Award Ceremony for the East Meadow Association of Girl Scouts at W. T. Clarke High School in Westbury. Presiding Officer Gonsalves presented Jamie Schick, the Gold Award Recipient for East Meadow’s Association of Girl Scouts, with a Nassau County citation in honor of this momentous occasion. To attain the Gold Award, Jamie’s project entitled “Growing Up is Hard to Do” addressed the challenges that young girls face while growing up that can often negatively affect their self-esteem. Jamie held workshops providing information and helpful tips to girls who were starting middle school, as well as addressing the problems girls face due to bullying. She created an online blog reaching out to young girls with positive messages of staying true to who you are despite external pressures to change or conform. Pictured (l-r): Gold Award Recipient Jamie Schick and Presiding Officer Norma Gonsalves.